Over the last few months, the range of products for you grew significantly. 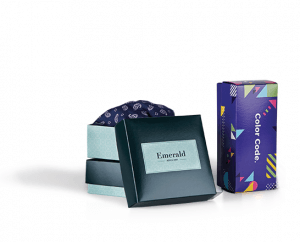 Some of our new packaging solutions are complementary to others – find out how can you use them and create a set of your own, branded packaging. 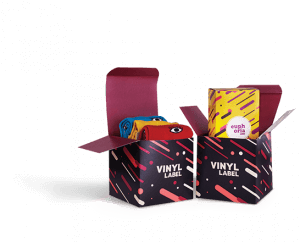 After releasing 6 new products in 2018 (including cardboard envelopes and wine boxes that we described here), 2019 will bring you even more cool solutions and accessories to make your brand stand out. It’s a perfect chance to sum up the changes we’ve introduced and give you some ideas on how to use them in your business. 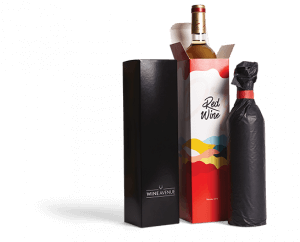 Product Boxes – in all three variants (Wine, Classic and Two-Piece) – are available in the kraft version. But.. what does “kraft” mean exactly? Kraft refers to the brown colour of the paper material that’s used to produce the boxes. This kraft paperboard looks very similar to cardboard – both in colour and the surface texture. 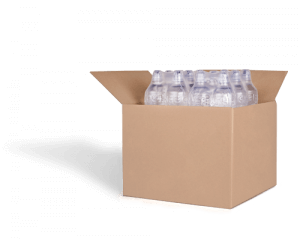 However, there is an important difference between cardboard and paperboard boxes. As all of the Product Boxes within the range of products of Packhelp, these Kraft variants aren’t suitable for shipping. 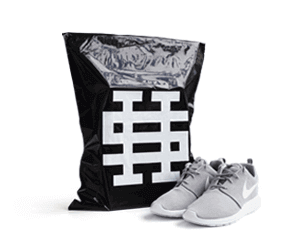 You can use them as product packaging in a store, to showcase your products or sell them directly. 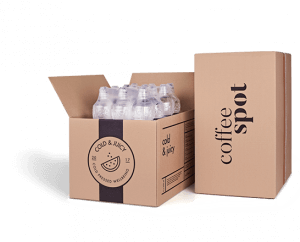 The kraft boxes with lids are particularly interesting, as they combine a premium character with an eco-friendly approach and look. 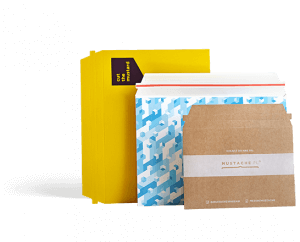 If you are intrigued by the Kraft variant of Product Boxes, see how a Dutch brand Slopes & Town designed them. 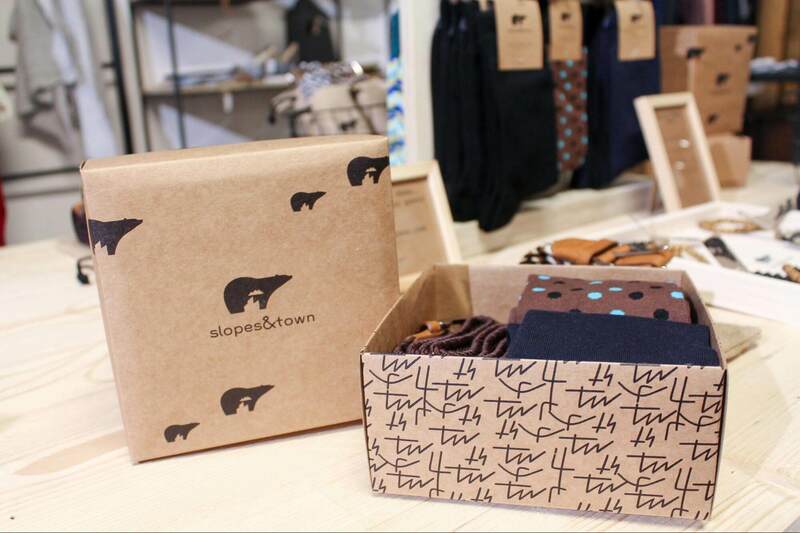 The Kraft Product Boxes were used by Dutch brand Slopes & Town, a producer of belts and clothing accessories, all packed for customers in small boxes with lids. The design used the company’s logo on the lid and a pattern on all sides of the bottom (the design that referred to the company’s concept of an active lifestyle). How can you create the Kraft boxes like Slopes & Town? 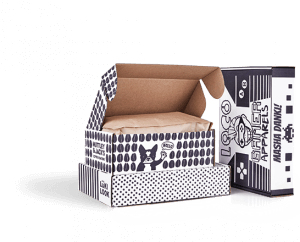 You can find Two-Piece Kraft Product Boxes in the list of all our products. To make it easier, you can click on the button below too. Choose the kraft variant directly in the editor. The designing process will be the same as other types of Product Boxes. 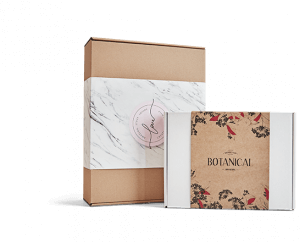 Spruce up your packaging design with a more organic approach! 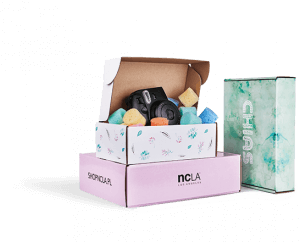 Packaging design depends on many factors, including the size and weight of your product, whether it’s fragile or not or how do you approach your branding. 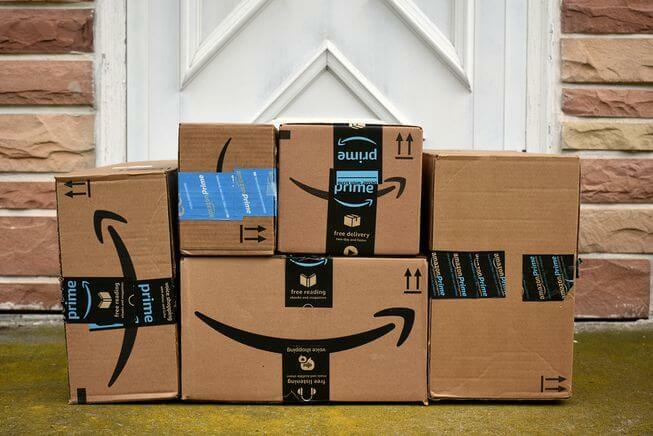 Consider the example of Amazon. Do you recognize their packaging in an instant? 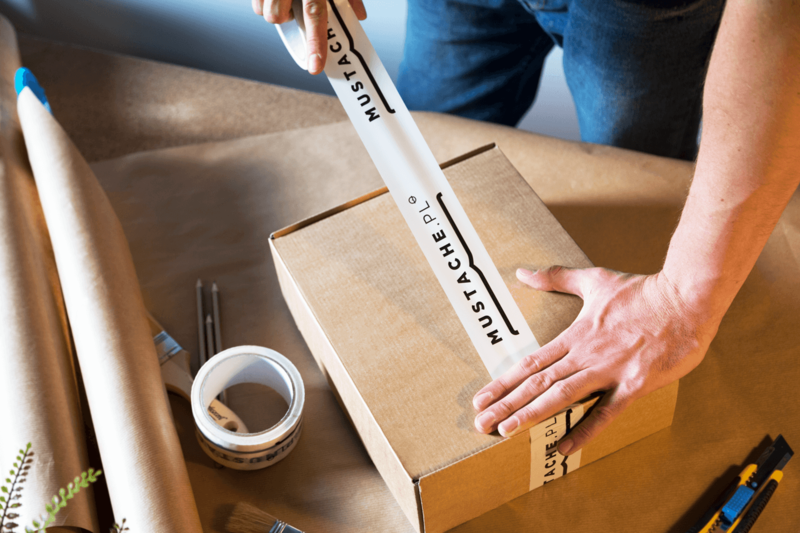 Their boxes look plain – sure, but the detail that makes up for the whole “branding thing” is a packaging tape with logo. You can order tapes like that as an additional accessory to your boxes. 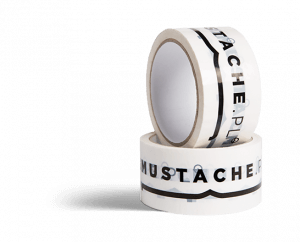 The packaging tapes are available with a unicolour imprint and are perfect to showcase your logo or add a clever slogan. Additionally, tapes can be used to add extra security measures to your package. They are very durable and both glue and paint used in their production will survive tough weather conditions. 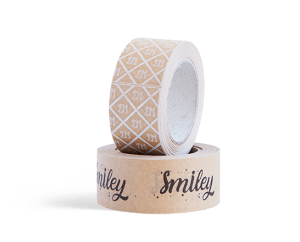 Add tape to your packaging and increase the shipping safety without compromising your design. What makes packaging look premium? There are several answers you will find. Some people will argue that it’s the colours like black, gold and silver that create an upscale mood. Others will point out that premium packaging needs a special kind of finish or detail – like a magnetic closure or embossing. There isn’t one correct answer. A black, matt foil will look premium on its own but so will an embossed, silver logo on a kraft box. However, these two solutions are probably not fitting for the exact same products. The first will look great for electronics, while latter – natural cosmetics. 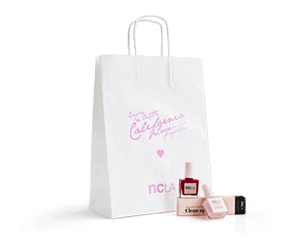 One of the ways to increase the aesthetic value of your packaging is to use custom tissue paper. Tissue paper is a semi-transparent, thin layer of paper that you can use to nicely wrap your products around. It comes with a graphic of your choice and in a range of colours. It is also very easy to create the repeatable pattern that’s printed on your tissue paper. 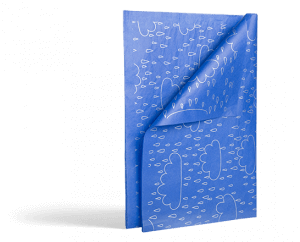 As mentioned, tissue paper is the first product in the range of Packhelp’s packaging solutions, which includes patterns. Patterns help you save time in the process of designing. Instead of adding the same graphic multiple times, your pattern is generated automatically. Directly in the editor, you will find the option of creating a pattern printed on your tissue paper. How can you modify your pattern? All you need to do is to add the file – your logo, your company name, or any other pictogram or simple graphic – and the pattern is generated automatically. Then, you can choose between an angled, straight or single placement of your graphic element. Just like in the gif above. Note: tissue paper includes imprints performed in PANTONE colour palette and 18 different colour bases that you can choose from. After a few minutes only, you can have your tissue paper ready to order. 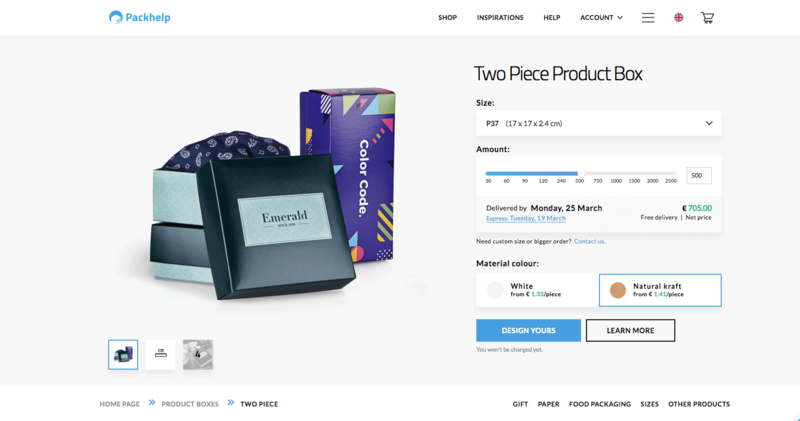 Once it’s done, you can move on to other packaging solutions you might need – just jump to shop, because your tissue paper design will already be saved. Would you like to try designing your tissue paper? Back in 2018, Packhelp has introduced the product cart feature. This simple tool allows you to add multiple products to your cart and order them as an entire bundle (without the need to buy each product separately). Those are some of our suggestions, but the vision is yours. If you want to know more about the cart and its features, click here. What’s More To Arrive in 2019? Our product range will soon grow even more. Soon we’re expecting to launch paper tubes – ideal to ship posters, rolled-up clothes and other longitudinal products. Each paper tube will include a metal lid that will secure the products inside. We will also make a significant step toward sustainability. 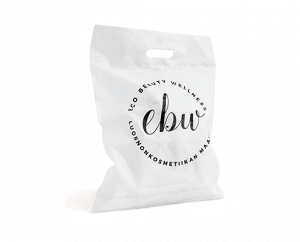 Our offer will be soon expanded thanks to Bio Poly Mailers too. The new, upgraded version of poly mailer will be fully biodegradable and made from corn starch. Each poly mailer will have a handle and a will come with printing variants too. If you are already fidgeting in your seat, you can send us a quote request now – you will have the chance to plan your budget ahead! The growing range of products is the result of your genuine interest in our offer. Your needs define, which products join our list. Hence, if you have an idea for a product that you would like to order with us, let us know! 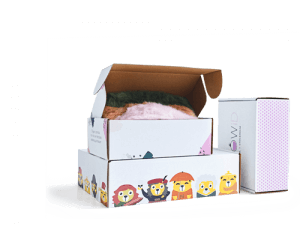 Are you ready to improve your company’s performance with branded packaging? Start designing your set! We also make Mailer boxes Product boxes Shipping boxes Poly Mailers Paper bags Envelopes Tapes Paper tubes Tissue paper and more .